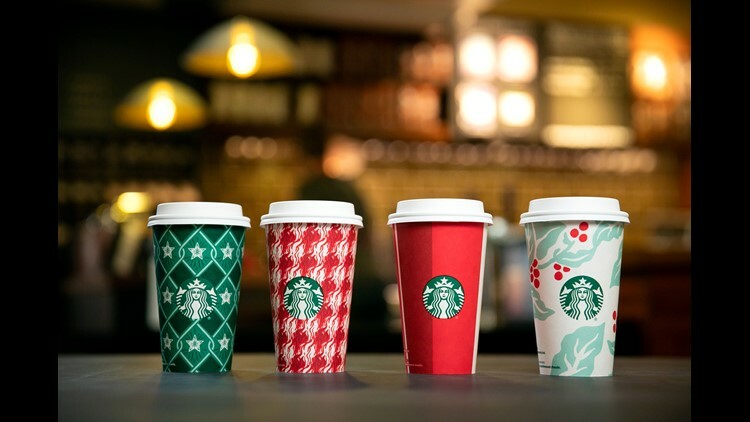 Starbucks has unveiled four new holiday cups. This week's Starbucks Happy Hour has a holiday twist. Starting at 3 p.m. Thursday through closing time, buy any grande or larger holiday beverage and get one free at participating Starbucks stores in the U.S. and Canada. The coffee giant's line of holiday drinks include Peppermint Mocha, Caramel Brulée Latte, Chestnut Praline Latte, Gingerbread Latte, Eggnog Latte and the new Juniper Latte. Hot, iced, blended and crème versions of the drinks are included in the Dec. 6 Happy Hour event. Although the Happy Hour events are for members of Starbucks' loyalty program, there's a way for anyone to save. The Dec. 6 Happy Hour offer has been loaded to Starbucks Rewards members accounts and non-members can sign up for a code at https://happyhour.starbucks.com. According to the fine print, this offer excludes hot and iced brewed coffee, ready-to-drink beverages and Starbucks Reserve beverages. Starbucks revamped its popular Happy Hour program in March. When the program first began in 2010, it was focused on the Frappuccino. Happy Hour now goes beyond the blended drink, and offers rotate to include espresso and iced tea, too. The discounts also vary, and sometimes it’s a buy-one-get-one free deal and others it’s half-price drinks.